Digital signage delivers messages in a flexible, engaging, interactive, personal and customised way. Our experienced team combine cutting edge technology with industry leading creative to deliver innovative experiences that are engaging and visually stunning. 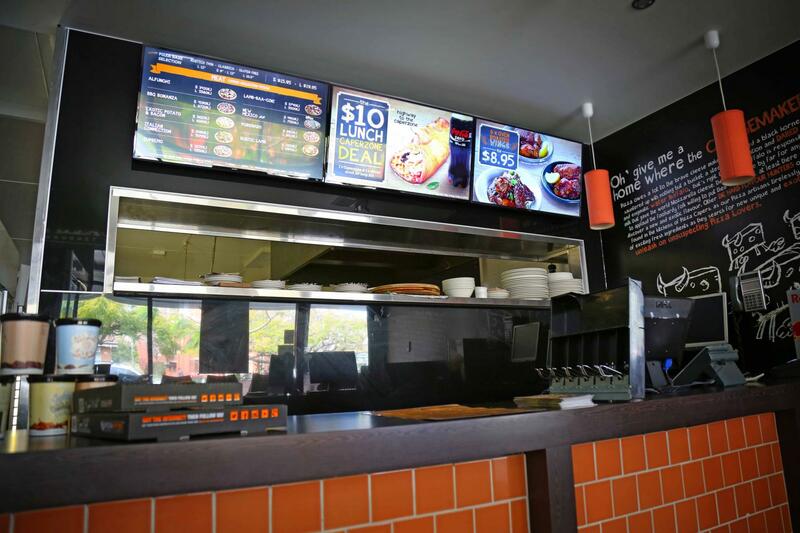 Digital menu boards allow restaurants to easily implement day-part scheduling, rapidly deploy pricing changes and experiment with different content, menu items and promotional campaigns. Through the combination of dynamic and captivating video along with the ability to up-sell and promote new items instantly, digital menu boards ultimately give companies the marketing control they need. Taking digital menu boards outdoors has created an efficient drive-thru process for quick service restaurants. Whilst enhancing the customer experience through targeted content based on real-time customer information, outdoor digital menu boards are also proven to improve operational efficiency, reduce food waste and increase sales. View our solutions for Pizza Capers, Guzman Y Gomez and Coffee Bug Express. The use of a video wall provides an excellent opportunity for businesses to maximise the digital signage experience. If you need to create an in-store atmosphere or want your message to interact with your customers or employees, then this could be the perfect digital tool for you. Video walls can be designed in different formats allowing for large screens or custom designs enabling your content to have maximum impact. Align screens side-by-side or on top of each other to display more of your content and make the most of your space. Each screen can function independently to display different content or can combine to promote that a single special image, video or promotion on a large scale vivid, vibrant digital screen. Promote your brand with stimulating full colour images or video and capture the interest of shoppers and passers-by. Embrace these large dynamic displays by displaying strong, impactful content to inspire and engage your customers – and increase your sales at a lower cost. Replacing static posters with digital signage enables an enhanced customer experience allowing businesses to engage with customers through customised content, interchanging messages in real time and increasing sales. Our free standing indoor digital kiosk is the perfect solution for countless locations and industries. The ultra slim design, fitted with an ultra-bright screen and a vandal proof exterior, enables the kiosks to fit seamlessly into any location. With the ability to be double or single sided and integrate with an interactive screen, our indoor digital kiosks perform best when placed in high foot traffic settings such as shopping centres, hotels, casinos or airports. The integration of technology allows the kiosks to perform a wide range of functions, including wayfinding, web browsing or self-service kiosks. Sharing vivid, highly visible digital screen content in any environment can be a challenge at times. Utilising an industry leading aluminium kiosk and IP67 ultra-bright screen, our outdoor digital kiosks are designed to withstand the heat, cold, rain, dust and snow. The ultra slim design enables the kiosks to fit seamlessly within any location, perfect for a variety of industries. Replacing static posters with digital kiosks enhances the customer experience by allowing businesses to engage with customers through targeted content based on real-time information and in turn, increase sales. The outdoor digital kiosk has proven to be invaluable for the parking industry, providing operators the ability to update parking messages and pricing instantly. View our solutions for Brisbane Airport and Vicinity Centres. LED displays are an engaging, dynamic and flexible promotional platform. Indoor or outdoor, single or double-sided, stand alone or integrated within a pylon sign, with a range of pixel pitches, the possibilities for LED are endless. The evolution of flat, curve and wrap LED technology provides unique opportunities to build ambiance through impactful content and enhance the customer experience. Outdoor LED enables businesses to gain control over messages, managing communications on timely, promotional and demographic cues. In turn, this will improve a business’s flexibility to react to changing market conditions, increase speed-to-market of promotions, engage passing traffic and increase walk-in customers. Integrating an LED screen within a pylon sign provides businesses with the full impact of traditional static signage, whilst also providing the flexibility to deliver targeted customer messages. With many years’ experience in neon manufacture and installation the CV Media & Signage team is a leader in delivering tailor made neon and LED solutions. Neon signs are eye-catching to passers-by with their alluring glow. Using leading international products, coupled with the introduction of new LED technologies; it is possible to produce striking signage that is sure to fit in with your companies marketing strategy. Projecting images provides you with the ability to promote your business on a larger scale. It can be used on a wall, windows or the floor where space wouldn’t normally be used for traditional static signage. Projection can be a cost effective digital solution for generating larger images and content. Projection can also become an interactive touch point for your customers. Provide the ability to browse, receive personalised offers, and engage with your brand by offering a touch-friendly projected experience. Interested? – watch the video below for a projection concept developed by the CV Media & Signage team. We also supply a full range of projectors for presentations. CV Media & Signage’s customised APM display provides another avenue for parking operators to engage with their customers. With the ability to integrate engaging video and audio content, operators can guide their customers through the payment process or inform them of current and upcoming promotions.